Metamaterials invoke the image of subwavelength metallic resonators, but there is absolutely no reason why it should be made of metals. So we designed and tested Silicon-process compatible metasurface in the infrared wavelength range. These metasurfaces show very high Q (>100), extreme chirality, and polarization conversion along with very low-loss operation. The high- Fano-resonant dielectric metasurfaces described here represent a novel and promising platform for a variety of applications that depend on high optical energy enhancement and precise spectral matching between molecular/atomic and electromagnetic resonances. Those include infrared spectroscopy of biological and chemical substances and nonlinear infrared optics. Chiral properties of such metasurfaces might be exploited for developing novel ultra-thin infrared detectors sensitive to light’s chirality, as well as spectrally-selective CP thermal emitters. Even higher quality factors (∼1000 ) Fano resonant metasurfaces can be developed by judicious engineering of near-field coupling between resonant modes if inhomogeneous broadening due to fabrication imperfections can be overcome. Combining the large field enhancements achieved in such high-Q silicon metasurfaces with coherent radiation sources such as quantum cascade lasers capable of delivering high-power low-divergence beams would open new exciting opportunities in nonlinear infrared optics such as harmonics generation and four-wave mixing using free-space excitation. They show promise for sensing applications as well as spectrally selective CP thermal emitters. 2. Wu, C. et al., Fano-resonant asymmetric metamaterials for ultrasensitive spectroscopy and identification of molecular monolayers. Nature Materials 11, 69 (2012). 3. Kildishev, A. V., Boltasseva, A. & Shalaev, V. M., Planar Photonics with Metasurfaces. Science 339, 1289 (2013). 4. 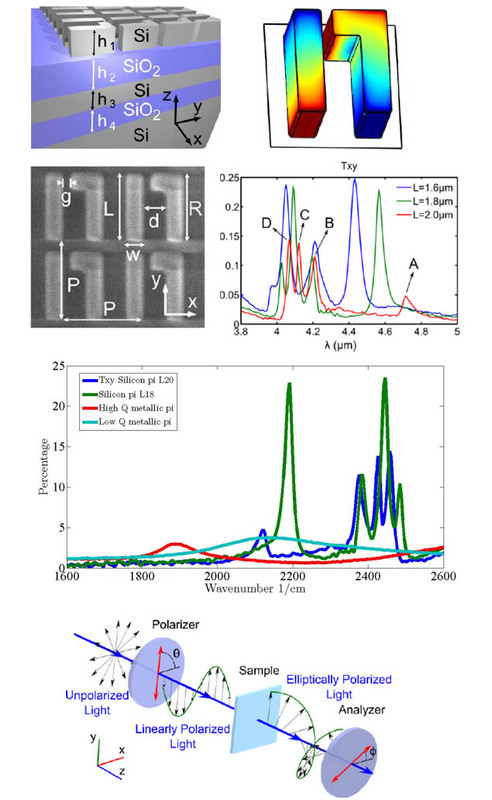 Miroshnichenko, A. E. & Kivshar, Y. S., Fano Resonances in All-Dielectric Oligomers. Nano Lett. 12 (12), 6459–6463 (2012).